Saudi Arabia has launched airstrikes to stop the advance of the Houthi shia rebels, supported by Iran. The move is meant to “defend the legitimate government” of President Abd rabbu Mansour Hadi, said the Saudi ambassador in Washington, Adel al-Jubeir. 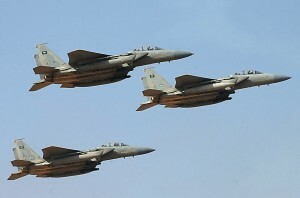 The Houthis “have always chosen the path of violence and Saudi Arabia will do anything necessary to protect the people of Yemen and the legitimate government of Yemen”, added the Saudi diplomat. He also said that Saudi action was made following “a request from the legitimate Yemen government”, noting that the GCC countries have tried “to facilitate a peaceful transition of government in Yemen but the Houthis have continuously undercut the process”. The US confirmed its support to an international military alliance to counter Houthi rebels who made rapid gains in recent months, forcing Yemeni president Hadi to flee the capital Sanaa. A White House spokesman said Washington is providing “logistical and intelligence support” to the Saudi-led campaign against the houthi rebels seeking to overthrow the Yemeni government and expand shia influence in the region. According to some experts, the widening of Yemeni conflict could affect and disrupt global oil supplies as Brent crude oil prices went up nearly 6 pc soon after the operation began. Several western countries have condemned the military actions taken by the Houthis against the elected government of Yemen, plunging the country into chaos and widespread instability. Written by: Peter Mulvany on March 26, 2015. Posted by Peter Mulvany on Mar 26 2015. Filed under Gulf News, Headlines. You can follow any responses to this entry through the RSS 2.0. Both comments and pings are currently closed.